The Latin America Working Group with other organizations launched a petition in March to tell the Trump Administration to stop its senseless policy of family separation at our border. The overwhelming support the petition received was incredible—it got over 130,000 signers! So, we kept up the momentum. We combined our original petition with others and delivered over 300,000 signatures to Secretary of Homeland Security Kirstjen Nielsen. And we didn’t stop there. 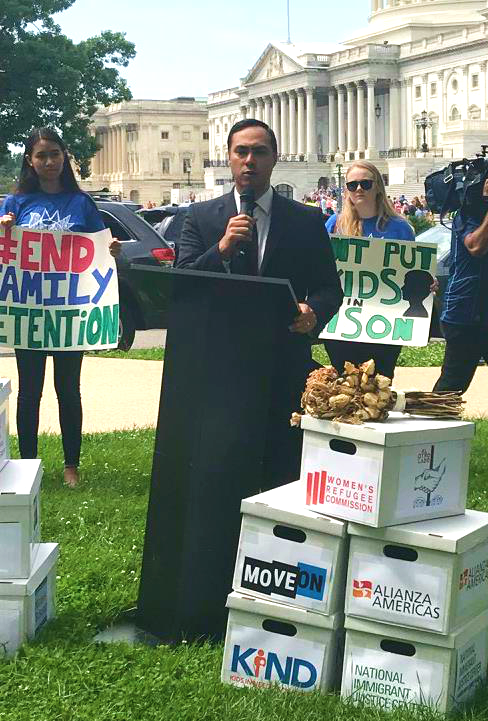 In early June, we also organized a petition delivery and rally outside the Capitol, joined by three Members of Congress, to show our government that we stand with families. There’s still plenty of work to be done, but we’re not losing steam. Join us! This page gives background on the policies and impact of family separation and detention, our efforts to stop it, and ways you can get involved—it’s never too late to stand up for what’s right! Activists at the petition-delivery rally outside the Capitol. addressing the crowd at the press conference and rally. Watch livestreams of the rally here or here. Check out some photos of the rally. 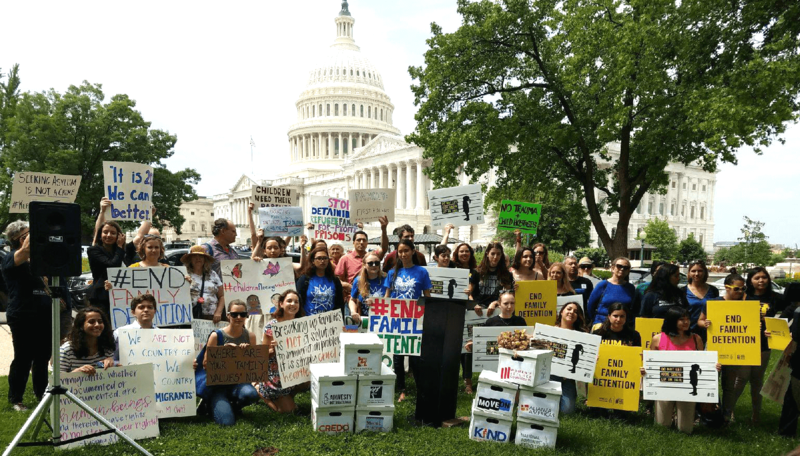 Urge your members of Congress to cosponsor the Keep Families Together Act (S. 3036 and H.R. 6135). Join the nationwide protest to keep families together on June 30th in Washington, D.C. Family detention, as opposed to separation, is still NOT the solution. 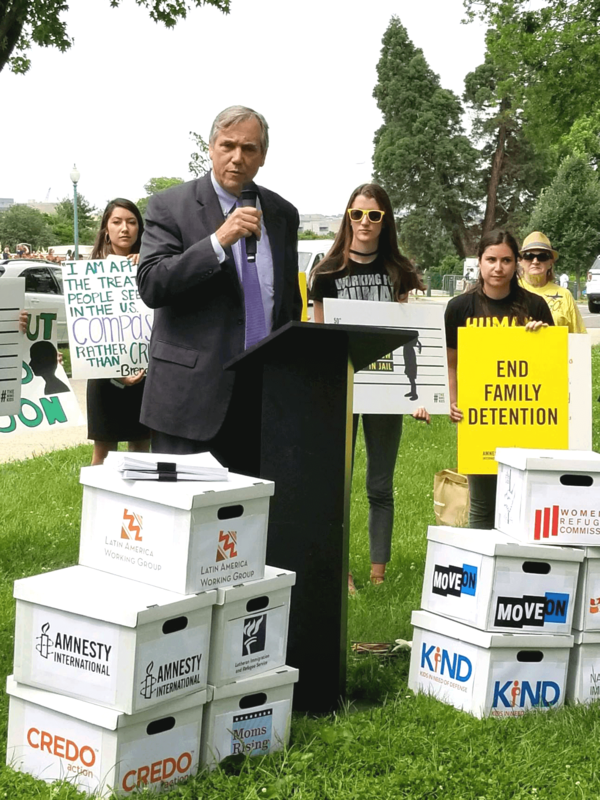 Ask your legislators to speak up against the policy of family separation and detention and to defund border militarization and Trump’s deportation forces. Demand they vote NO on the Securing America’s Future Act of 2018 (H.R. 4760) and the Border Security and Immigration Reform Act of 2018 (H.R. 6136). Support our work! We need your help to keep fighting the good fight! The Trump Administration has been contemplating using the threat of family separation since last year. In fact, around 700 kids were snatched from their parents from October 2017 to April 2018, including 100 under the age of four. However, the practice was officially instated at the beginning of May, when Attorney General Jeff Sessions announced that the Department of Homeland Security (DHS) was implementing a new “zero tolerance” policy. The policy institutionalizes family separation at our border and criminally prosecutes all border-crossers, including asylum-seeking families and children. The administration claims that this measure will deter families from fleeing to the United States, but we know that it is nothing more than a heartless attempt at punishing families for trying to escape dangerous conditions in their home countries. 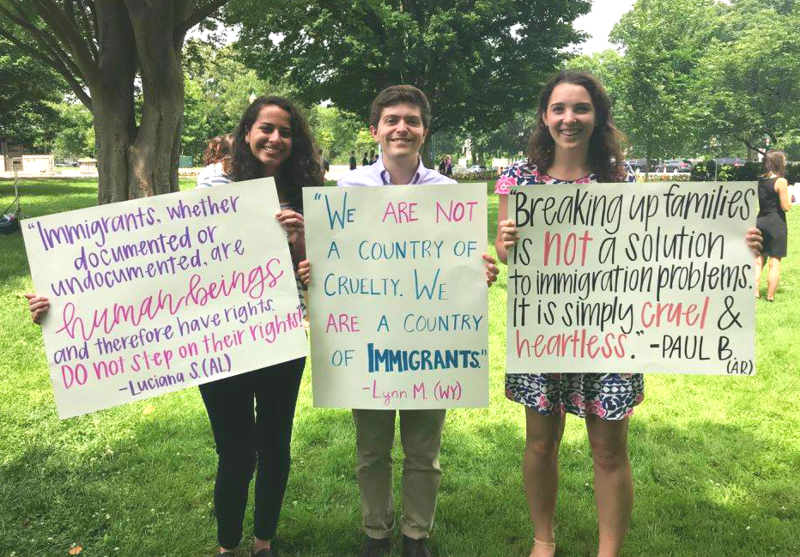 LAWG interns Ana, Bo, and Micaela at the rally. DHS Secretary Nielsen testified twice in May before members of the Senate. Both times, she said family separation was a necessary part of the administration’s “zero tolerance” policy. And she’s continued to lie about it, going as far as saying that the administration is not separating families. But we all know what’s really going on. The New York Times reported that 1,995 children have been separated from their parents from April 19 to May 31—that’s just six weeks. If this policy continues, many believe the number of cases of family separation will only continue to increase, unlike what this administration wants us to believe. On June 20th, Trump signed an executive order to “keep families together,” but what he’s really saying is that he’ll keep families detained indefinitely. We know better. Locking up families is not the solution either. What’s more, his order does nothing to address the more than 2,000 kids have already been separated. There’s no justification for either of these practices. These families and children aren’t threats to our safety. They’re often fleeing unspeakable violence and persecution in their home countries. Many are from Central America, home to some of the most dangerous countries in the world. Families are stuck Between a Wall and a Dangerous Place, something we’ve extensively documented. Children belong with their parents in safe communities, not locked up in detention centers. This is nothing more than a cruel, costly, and unjustified practice. P.S. Want to do more? You can further support our work to keep families together and improve in-country human rights conditions by becoming a LAWG member! NOW’s the time to pass permanent protection for Dreamers and TPSianos! Call out the #SOTU2019. Call to #DefundHate!